What is the Matthew 25 Movement Pledge? A gathering in November 2016 of Christian organizers from around the nation came up with this pledge as a way to connect and support Christians seeking to respond to the plight of immigrants and other vulnerable people at this historic moment. The message of Matthew 25 is rising up at the grassroots level and among faith leaders — within faith communities, congregations, denominations, seminaries, and faith-based organizations. It's the Gospel text where Jesus says: How you treat the most vulnerable is how you treat me. 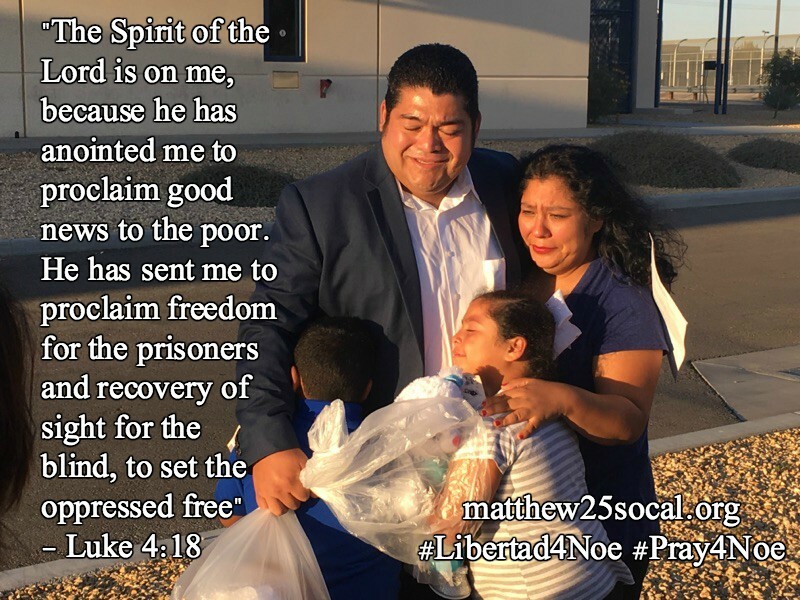 The Matthew 25 / Mateo 25 Movement is a broad coalition of national faith-based groups, local churches, clergy associations, grassroots activists, heads of denominations, seminaries, Christian colleges, and more. We are focusing on these three groups of people who are especially at risk right now: undocumented immigrants threatened with mass deportation, as well as refugees who are being banned despite rigorous vetting; African Americans and other people of color threatened by racial policing; and Muslims, threatened with banning, monitoring, and even registration. We are also providing support and safe spaces for Christian activists who need spiritual support. Pray for people who will be vulnerable to being harmed if the new federal administration carries out all of its promises and threats. Provide opportunities for education and dialogue about the potential harm to vulnerable people. Place the pledge on your websites to offer your community a chance to pledge as an act of conscience and public witness. You keep their signatures in your own database. Offer resources and opportunities for effective methods for protection and advocacy. Collect, film, and publicize stories of vulnerable people hurt by these policies (protecting their identities, of course, per their desires). Faith-Rooted Organizing introduces to the church the idea that community organizing and our faith as Christians, which often seem at odds, can be integrated. And more than that can actually flow from a spirituality that embraces our call to love God and love neighbor!